Roseto is a country house turned into a splendid holiday residence in the Umbrian countryside. It is part of a larger property that includes two other houses, Il Nocino and Il Moraiolo. Roseto is a country house turned into a splendid holiday residence in the Umbrian countryside. It is part of a larger property that includes two other houses, Il Nocino and Il Moraiolo, completely independent and with its own swimming pool, for a total of 22 beds. The house is not far from Deruta, famous for its ceramics, and the ancient village of Montecastello. 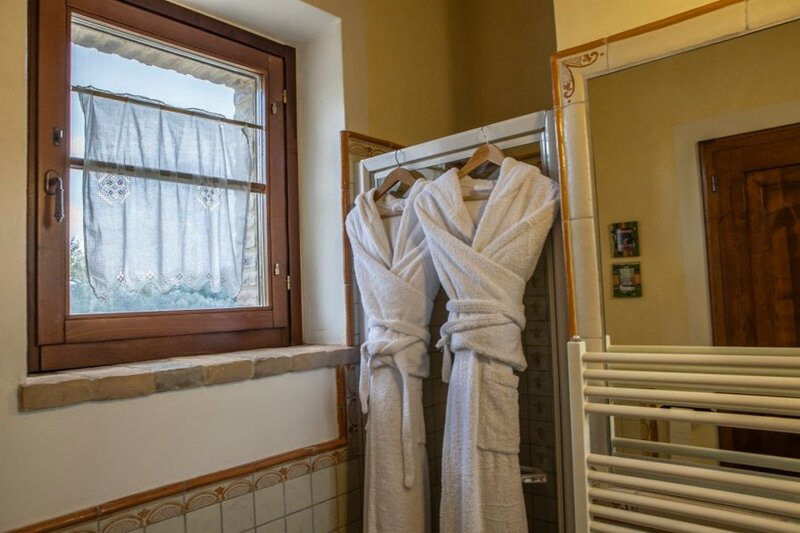 Centrally located in the Umbrian region, offering easy access to the major towns, such as Perugia, Assisi, Todi. Lake Trasimeno and the Fonte del Clitunno remembered, among many writers, even by the English poet Byron, are worth seeing. The house is surrounded by a large and beautiful garden with a lawn with flowering shrubs, a swimming pool (12x6) (18/05-30/09) and a porch equipped for outdoor dining (barbecue and pizza oven). Guests can also enjoy upon request, and exclusively by taking turns, a health club, located on the property that features a hot tub, sauna, Turkish bath, massage chairs, treadmills, spinning bikes, a rowing machine, step machine and weight machines. Included in the price a midweek cleaning (Wednesday). On request and to be paid for on location: maid service, a cook, babysitting and cooking classes. The accommodation has central heating, Wi-Fi and air conditioning. Parking on the property. PLEASE NOTE: arrivals must take place between 5:00 pm and 7:00 pm. ACCOMMODATION: (350 m2) Gr. fl. : living/dining room with fireplace and direct access to the porch, kitchen, 2 double bedrooms with bathroom with shower, WC. 1st fl. : (accessed from an external staircase) 2 double bedrooms with bathroom with shower. 2nd fl. : (tower) 1 double bedroom with bathroom with shower, kitchen with double sofa bed.